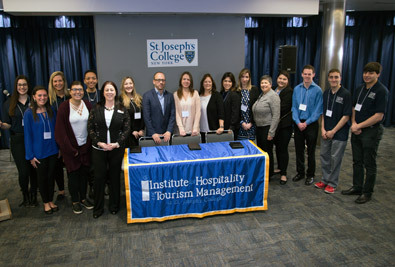 The Institute for Hospitality and Tourism Management (IHTM) at St. Joseph’s College provides a leading voice in the discussion of responsible tourism and hospitality. As the College prepares students for professional service, we seek to make a positive impact, not only on our local region, but on the global community. The relationship between the Institute and the tourism and hospitality industry is reciprocal. The College provides relevant training and research that enhances the industry and in turn, the industry provides students with valuable opportunities to link classroom learning with professional experience. The goal is to provide an education, rooted strongly in the liberal arts, that carefully integrates academic rigor with a career-related field placement. We invite you to join us at St. Joseph’s College for our Hospitality and Tourism symposiums where key industry professional discuss timely and relevant issues at our networking breakfast. The symposiums are free and open to the public. For more information, call 631.687.1273.